This indicator depends on the variety of ways which Mybet Casino offers his clients to contact customer support and the speed with which it solves a problem, as also the overall customer experience. The reputation rating of Mybet Casino is based on its popularity in online space - comments, user ratings on other sites, and social networking likes. 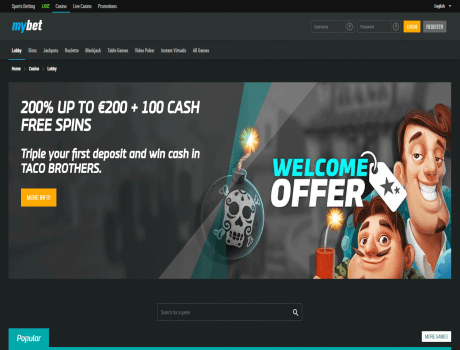 Make your 4th Mybet Casino deposit of at least 10€ and get 50 Cash Free Spins in Bonanza. Make your fourth deposit to casino and 50 Cash Free Spins for Bonanza will become available in the game. The Cash Free Spins will expire after two days. No wagering requirements are applied for winnings resulting from Cash Free Spins. Every Cash Free Spin is worth €0.10 and remains valid for two days.